There will be quite a few more faculty, staff and students in the upcoming SHSU group photo than there were in this early Sam Houston Normal class picture. Sam Houston State University students, faculty and staff are invited to have their picture taken with thousands of their closest friends while celebrating the university's 125th birthday on Tuesday, Oct. 12 at noon on Intramural Field No. 2. Events include the opportunity to be in a historic photo, and to have a piece of an eight foot wide birthday cake. And don't worry about missing classes. SHSU President James Gaertner has authorized the dismissal of classes from 10:30 a.m. through the third class period so that the entire campus community will have the opportunity to participate in the celebration. Activities begin at 11 a.m. A ceremony will take place at Austin Hall, followed by a faculty, staff and student processional through campus. The processional will arrive at the Intramural Field and a panoramic photo of all who are participating in the university's birthday celebration will be taken by Goldbeck Company Panoramic Photography of San Antonio, the same company that took the photo at SHSU's centennial celebration. Approximately 7,500 students, faculty and staff were in that photo, and President Gaertner has challenged the current campus community to break that record. "We've grown a lot in the past 25 years," said Gaertner, "and I hope that everyone will take this opportunity to be recorded in history as we celebrate our university's 125th birthday." Organization members are encouraged to wear their club identification t-shirts or jerseys. However, no wooden letters will be allowed in the photograph. Copies of the 10 x 38-inch color laminated panoramic photo are $20 each, and individuals can purchase them by going online to download the order form or by going directly to the photographer's web site. The last panoramic photo was taken on Oct. 10, 1978 where the Health and Kinesiology Center now stands to kick off events associated with Sam Houston State's 100th birthday. Paul Culp, special collections librarian, was one of those whose picture was taken. "I remember that it was hot," he said. "And I remember that some of the fraternity boys were trying to run from one side of the group to the other side so that they would be in the picture twice." Dorothy Roberson, assistant to the provost and vice president for academic affairs, remembers that she was standing next to her sister, Vicki, who was also a university employee at that time. Witold Lukaszewski, professor of political science, remembers the day as being festive and feeling special as so many gathered for the photo session. "I remember it was a warm day. A lot of my colleagues were there and President Bowers was in the row in front of us," he said. "My wife was standing next to me, and our young daughter watched from the side." After a moment he added, "I am astounded at how quickly the past 25 years have gone by." 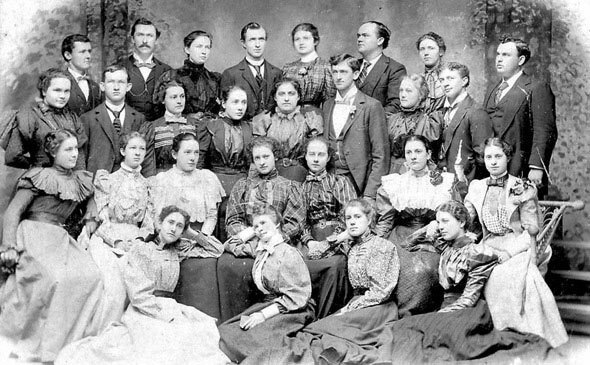 Group pictures have been a tradition at the university, almost from the beginning. Early pictures show students and faculty in a variety of locations on campus, mostly in front of Old Main or Austin Hall. The president's residence, now the site of the Lowman Student Center, is in the background of the group photo taken in 1920. Some of the pictures include groups of children from the university's demonstration school. "They wanted to have everyone associated with the campus community in the pictures," said Barbara Kevit-Mason, the university archivist, who cares for the historic photos. Copies of the university's early group photos, as well as the most recent one, may be viewed in the University Archives, located in Room 400 of the Newton Gresham Library. A copy of the centennial panoramic photo is also on display in the SHSU Public Relations Office in Room 115 of the Administration Building.